In April the weather begins to be stable and it is enjoyable to go for a stroll or to spend more time outside. It is what Italian people do in this period. When the weather gets hotter we like to go for a ride in the countryside or to walk along the seashore breathing the marine breeze. Now it’s time to pick up asparagus (what I did on Easter day!) or enjoy the remained snow high in the mountains. The desire to to go out to visit new places or to attend the local events gets stronger and below I will give some advice on what to do during the month of April. Remember that 25th April is a bank holiday. We celebrate the Italian Liberation Day, that is the day when we got free from the German occupation thanks to the American Army in the 2nd World War. 28th of April is an important day for Sardinia: people celebrate Sa die de sa Sardigna (Sardinian pride day). This event remembers when Savoy were forced to leave Cagliari and to come back to the Italian peninsula. Throughout the island is possible to attend to commemorative events. Are you ready to plan your visit in Italy? May Italians live without events related to food & wine? Not at all! Therefore in April there are many occasions to eat our tasty food and to drink our delicious wines. As I mentioned before, it is the best time for the asparagus now and you can eat or buy them in Mesola during the 28th edition of Fiera dell’asparago. The typical green asparagus grows in the sandy soil of the Po river delta. You can taste all the products of the area, buy local products displayed on the market’s stalls inside the Estense’s castle and join the scheduled activities, like guided tours through the Gran Bosco della Mesola (Great Wood of Mesola). There are many species of asparagus in Italy. 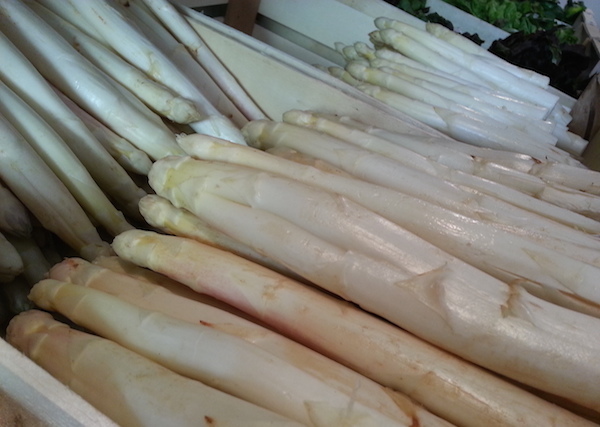 This is the white asparagus of Fossalon, Friuli. If you are looking for something more world-famous, on 16th April you have to be in Genua. There is the World Championship of Genovese pesto. We dedicated an entire article about Genovese pesto and I suggest you to read it, if you would like to know how to make an authentic pesto. In 2018 the event has been held in March. Friuli Venezia Giulia is an Italian region on the north-eastern border. It is remembered in the Italian history because in the northeastern part of the region there was the Austro-Hungarian front during the 1st World War. Nowadays it is a land of some good white wines that you can taste along with some typical food when Osmize (Friuli’s typical places) are open as in this month. Are you a very wine lover? You couldn’t miss Vinitaly from 15th to 18th April at Veronafiere in Verona. It is the 52th edition of this international wine and spirits exhibition. It represents one of the most important dates for every Italian (and not only) wine producers. In the city centre there are many off-show events, like music and cultural performances, dj sets, meetings focusing on food and wine topics and much more. 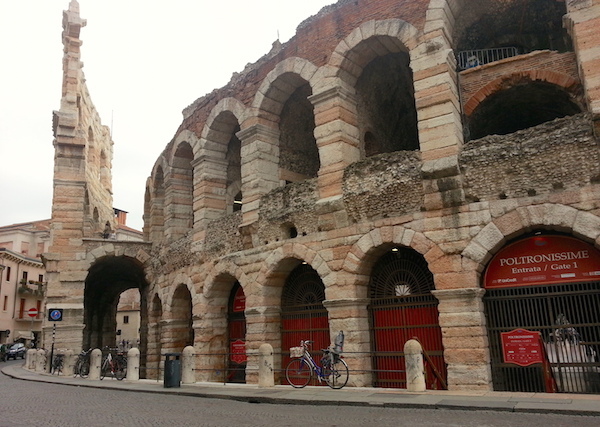 It could be a good occasion to visit Verona, the city of love. Verona is one of the Italian places not to be missed. This is the Arena, an important Roman amphiteatre. If you don’t like crowds it is better to choose other destinations. You can travel to San Pietro di Barbozza in Treviso where you can sip a glass of prosecco from 31st March until 30th April at the 48th edition of the Mostra del Cartizze e Valdobbiadene DOCG. Otherwise you can move to Pesaro (in Le Marche region on the Adriatic coast) for the Pesaro Wine Festival from 7th to 8th April. On 7th and 8th April Il Diamante nero takes place in Scheggino, Umbria. This market exhibition is organised to promote the products of the Valnerina area, especially the black truffle. 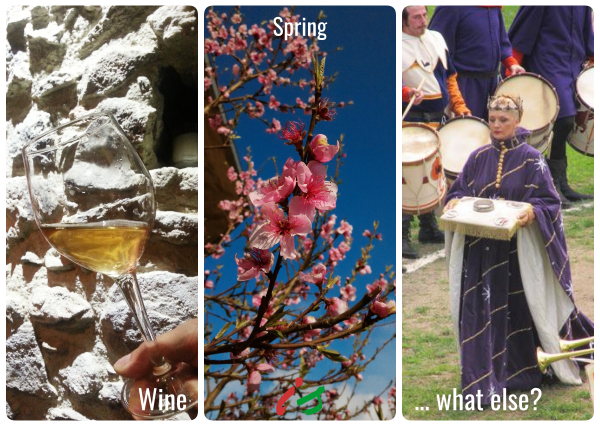 While in the same days (6-8th April) Subasio con gusto (Subasio with taste) in Spello is dedicated to the country herbs. Subasio is a mount and an ideal place where you can hike or simply go for a stroll. Have you ever tasted a piece of fresh ricotta? You don’t know what ricotta is? It is a dairy product (not a cheese) made almost everywhere in Italy. Vizzini, near Catania (Sicily), is the hometown of Giovanni Verga, one of the most famous Italian writers, and today it is become the hangout of ricotta lovers. Sagra della ricotta e del formaggio takes place on 24th and 25th April. Not far from Vizzini there is Niscemi, where from 31st March to 2nd April the Sagra del carciofo violetto (violet artichokes) is held. Very good reasons to visit Sicily and its wonderful sights. I think spring is the best moment of the year to get in touch with nature and its elements. Maybe for the numerous colours (I like them too much!) or maybe for the good smells, I prefer this season than any other else to discover how fascinating the nature is. Throughout Italy there are Feste di Primavera (spring festivals) to celebrate this season because they remember when the farmers were happy to see the winter ended and their fields full of new sprouts. Piemonte region is full of dates, for example in Mondovì there will be the 59th edition of the Festa di primavera (7th and 8th April). Good weather means “it’s time to go to the beach”. Sign into your planner these dates: from 20th April to 1st May. In Cervia (on the Adriatic coast) it takes place the International kites festival. A good occasion to breathe marine breeze and lying in the sun. In the next month we are going to talk about the bicycle and where to go in Italy. We’ll talk about special routes and what to know if you want to cycle in our country. Bicycle is your favourite mean of transport? Continue to follow us. San Giorgio worship is popular in Italy, but not only. In fact you can find churches in his honour in many European states or in the Middle East. He is the patron saint of some countries, like England or Georgia. Saint George’s day is on 25th April and in many Italian towns you can attend to a local fair or a celebration. For example in Gravina di Puglia a local fair in honour of Saint George has been taking place since 1294. In the past this kind of local fairs were the best moment for farmers to sell their goods and an occasion to meet people coming from distance. If you prefer historical celebrations you have not to miss two appointments. The first one is in Narni, Umbria from the last week of April until the second one of May. It is called Corsa all’anello (i.e. ride to the ring) and it is an historical reenactment. Otherwise you can travel up to northern Italy reaching Valle d’Aosta region – the westnorthernmost part of Italy. On 25th April in Nus it is celebrated Les Franchises de Nus, that remembers when Lords granted the franchises to the people living in Nus. Are you interested in Unesco World Heritage sites in Italy?